Have you seen this one? I like the concept but wish that the company had gone the extra mile on the exterior and interior design. 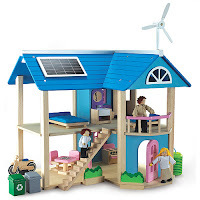 I dig on the solar panels and modern windmill on the roof. I’m disappointed with the touches of pink paint here and there. Hopefully the door is actually green and not pink (the photos show two versions). 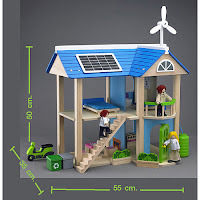 This dollhouse is supposed to help educate children about the importance of "living green” via play themes that include recycling, planting trees, alternative energy, alternative transportation and rain water collecting. It’s roughly $130 and comes with all accessories.